Officer, Senior Clerk, Gynecologist, Pediatrician jobs in Rajkot Municipal Corporation RMC recruitment 2018. Candidates who are having necessary qualifications they can apply online for this RMC recruitment 2018 from 06-10-2018 to 30-10-2018. Apply online for this RMC Pharmacist, FHW/MPHW Staff Nurse jobs through official website of www.RMC.co.in. Rajkot RMC Recruitment selection will be based written exam and/or interview. 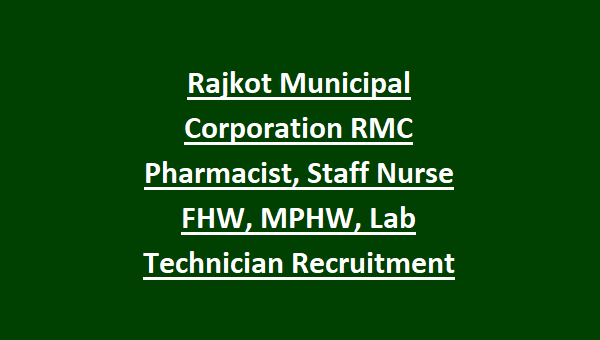 There are total 151 vacancies are in this Rajkot Municipal Corporation RMC Female Health Worker recruitment 2018. Post wise vacancies, qualifications, salary, RMC online application procedure and other details of RMC Pharmacist, FHW/MPHW, Lab Technician jobs recruitment 2018 is given below. There are total 151 posts in this Rajkot Municipal Corporation RMC recruitment 2018 under Urban health project 2018. For posts wise salaries refer official notification attached below. Candidates selection for this Rajkot Municipal Corporation recruitment will be based on merit in qualifications or written exam and/or interview. 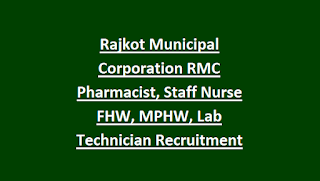 Candidates who are looking for vacancies in Rajkot municipal corporation health department and having necessary qualifications, they can apply online for this RMC Pharmacist, FHW/MPHW, Worker jobs on or before 30-10-2018. Official website to apply online is www.RMC.gov.in.